Sand colored country crocks , circa 1900's, bring that down-home feeling to any kitchen or dining room. The rear crock is 9" high with 9.5" diameter and blue handpainted floral design, priced at $260.00. 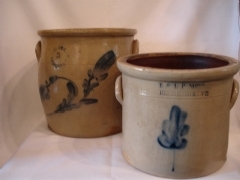 The front crock is inscribed with "Bennington, VT" and blue handpainted floral design. Size is 7" high with 8.5" diameter, priced at $280.00.